The Blue Star Leopard Wrasse, Macropharyngodon bipartitus, has a beautiful and unique color pattern. 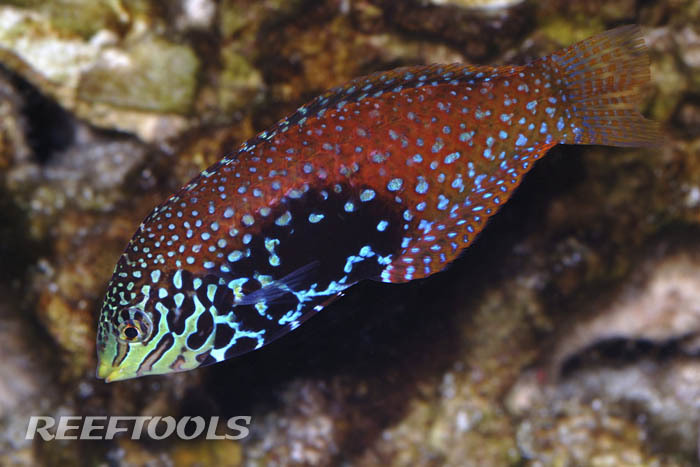 An artistic combination of blue, green, orange and tan spots cover the blue Star Leopard Wrasse’s body. This color pattern will change as the fish becomes a male. Also known as the Divided Wrasse, or the Vermiculite Wrasse, this African fish is peaceful and completely reef safe that may be kept in groups or with other friendly wrasses. An aquarium of 50 gallons or more containing other peaceful tankmates is appropriate for housing this colorful active fish. This wrasse may be shy when first introduced to a new environment, but once it has adjusted, you will she this brilliant fish swimming in and our of the rockscape throughout the day. A sandbed of a least 3-5 inches is required for this fish, as burrowing into the sand is their preferred sleeping arrangement. The Blue Star Leopard Wrasse is a carnivore, and should be offered a diet consisting of vitamin enriched mysis and brine shrimp, meaty food, as well as choice pellets and flakes. This fish should not be kept by an inexperienced hobbyists, as it is may be difficult to overcome their particular eating habits. You may need to feed this wrasse with live feeder shrimp or blood worms during it’s quarantine period, and slowly introduce it to vitamin enriched frozen food. A well-established refugium will be of great help with caring for the Blue Star Leopard Wrasse.